Gaylord Perry was inducted into the Baseball Hall of Fame in 1991. A five-time All-Star, Perry was a two-time Cy Young Award winner and led the MLB in wins three times winning 314 games in his career. Offered is one of Perry’s 1983 jerseys, the season in which he won his 300th game pitching on the road in this style. 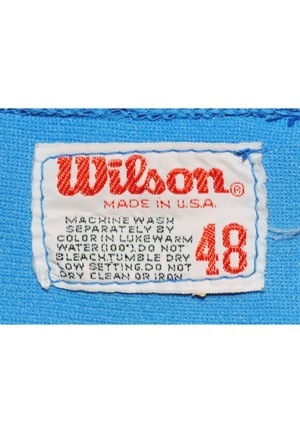 Beneath the rear collar is the Wilson manufacturer’s tag size “48” with washing instructions. 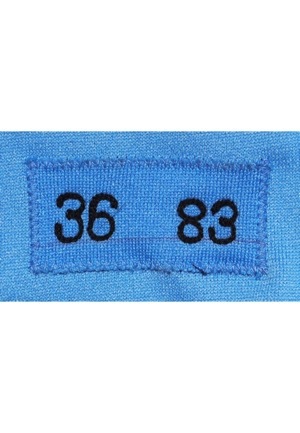 On the front left tail is a strip tag reading “36 83” embroidered. Across the chest reads “Seattle”. 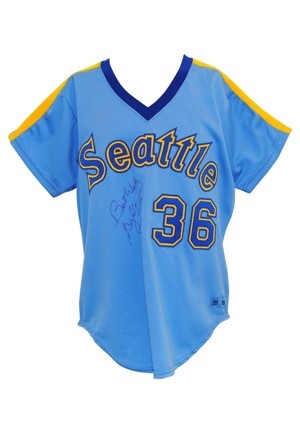 Adjacent below and on the back is the player number “36”. These are done in blue on yellow on blue triple tackle twill. 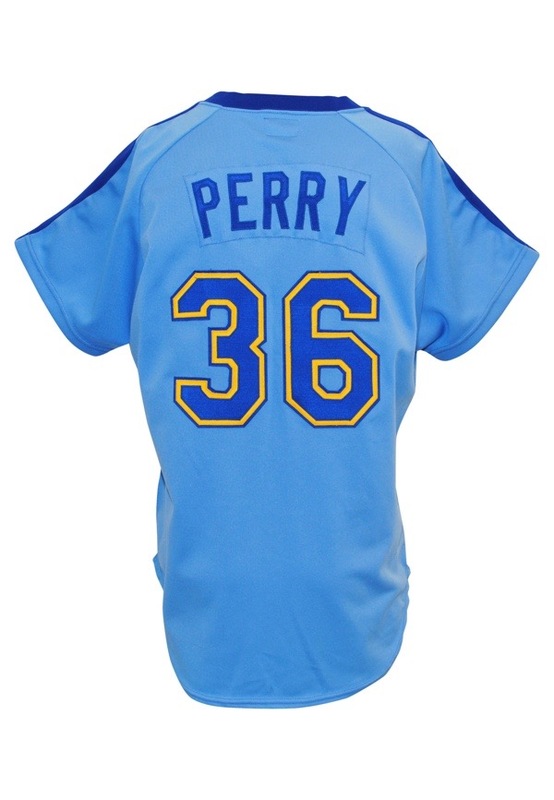 Across the back on a blue nameplate is the player name “PERRY” in navy blue tackle twill. 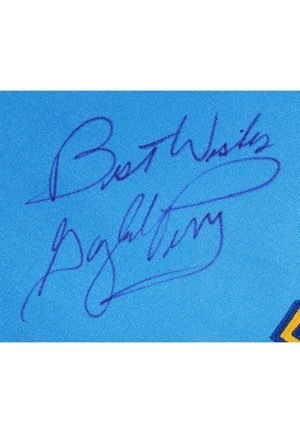 Perry signed on the front of the jersey in purple marker with the added inscription “Best Wishes” and in our opinion the signature rates a 9. This jersey is properly tagged, was presented to us as game-used and in our opinion shows appropriate use. Attached to the rear collar of the jacket is the Rawlings manufacturer’s flag tag size “ADULT X-LARGE”. 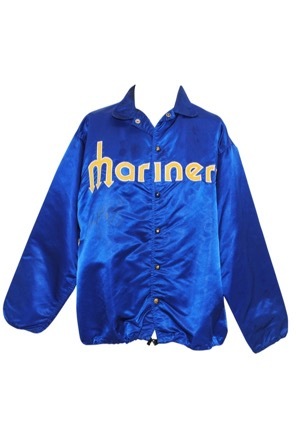 Across the chest reads “Mariners” in yellow on white tackle twill. Perry signed the front of the jacket in gold marker and in our opinion the signature rates a near 8. In the rear sweatband of the cap is the New Era manufacturer’s tag. Adjacent to the left is an official “MLB” logo flag tag and adjacent to the right is a heavily faded size flag tag. Under the brim of the cap is the player number “36” handwritten in blue marker. There is clear indications of residue on the inside bill as well. 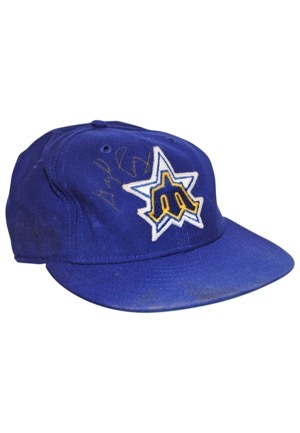 The Mariners team logo is on the front of the cap and Perry signed to the left of it in gold marker and in our opinion the signature rates a 6. 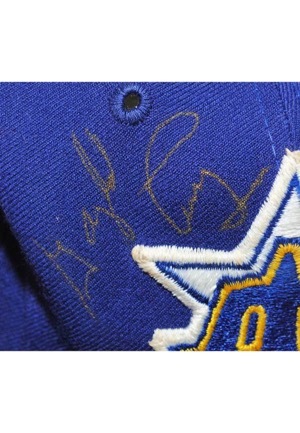 This jacket and cap are properly tagged, were presented to us as player-worn and show use. Accompanied by a LOA from JSA and an additional LOA grading the items an A10.